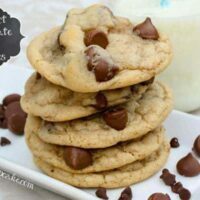 Chewy, slightly under baked, with chunks of chocolate and crispy edges, this is the perfect recipe for chocolate chip cookies! I’ve made plenty of cookies over the years… but I’ve never been able to master the best recipe for perfect chocolate chip cookies. Maybe it’s because every time I tried making the cookie with the recipe on the back of the Nestle chocolate chip package, they turned out horribly. They were always spread out thin and hard, never chewy and soft with crisp edges. Well, that’s until now. After I’ve finally made the PERFECT CHOCOLATE CHIP COOKIE! Well, perfect in my world. 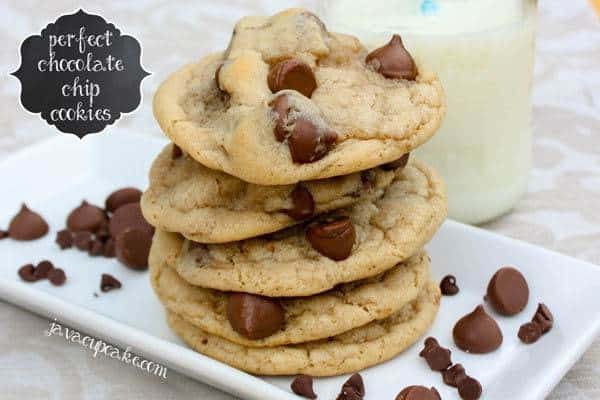 These cookies are big, chewy in the center, a bit under cooked, full of chocolate chunks, a bit crisp along the edges with the perfect golden brown color. They do take a bit of planning to make because they need some time in the fridge for the dough to set up. So, if you’re planning on making these… make sure you give yourself some time. Make the dough one day, bake the cookies the next… and then eat them ASAP. You won’t regret making these cookies. Best Ever! 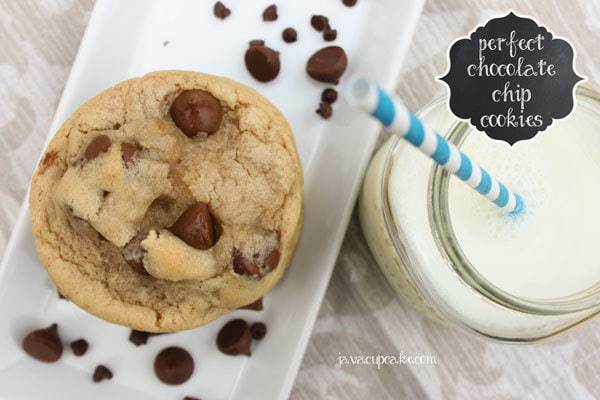 Chewy, slightly under baked, with chunks of chocolate and crispy edges, this is the perfect recipe for chocolate chip cookies! In a large bowl, sift together the flour, baking soda, corn starch and salt. In a medium bowl, whisk together the sugars until no more clumps remain. Add the butter and continue whisking until smooth. Add the eggs and vanilla and whisk until incorporated. Make a well in the flour mixture and pour in the wet ingredients. Mix with a wooden spoon until just combined. Add the mini Kisses and fold together. Cover with plastic wrap and refrigerate for at least 8 hours or overnight. When you're ready to bake, preheat oven to 325 F degrees and line cookie sheets with parchment paper. Roll 6 large balls of dough and place evenly on the prepared cookie sheet. You'll use 2-3 Tbsp of dough for each ball. Press 3-4 mini kisses onto each ball. Bake 11-13 minutes or until the tops are a light golden color. DO NOT OVERBAKE. Remove immediately. Allow cookies to cool on the pan for 2-3 minutes before removing to a wire rack to cool completely. Repeat process with all the cookie dough. Eat warm! Store cookies in an air tight container for up to 5 days. Yayyy! I love a good chocolate chip cookie! I an mew to Germany, do you use type 405 flour??? where do I find cornstarch and Hershey’s Mini Kisses?? Typically, yes you can substitute AP Flour for 405. As for the rest of the ingredients, I’m not sure where you can get them. I buy them at the commissary on the military post. Sorry I couldn’t be of more help. Well, I have a question. How can I form balls out of the dough if it’s frozen? Betsy, these are amazing as always!! I tried them yesterday and they were definitely a hit and I am definitely saving the recipe in the family book! 🙂 Thanks and keep up the great work! I love following your blog and loved even more to have had the chance of meeting you! Too bad it was so brief :/ …but still … 🙂 Keep your head up! I’m glad you like them!! 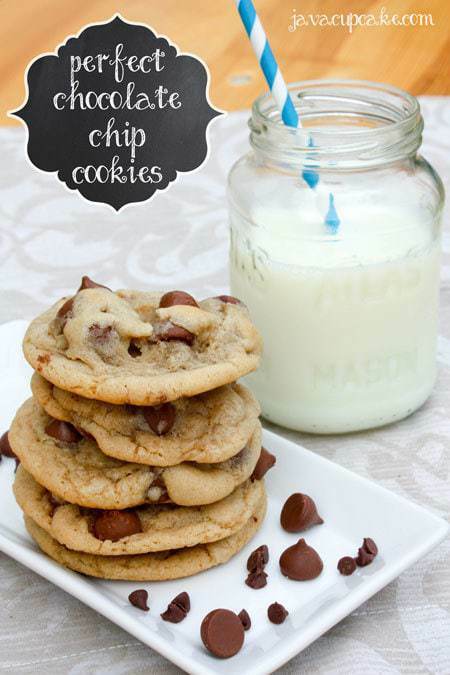 They are… by far….my most favorite chocolate chip cookies!! YUM! HOW DO I GET YOUR E-MAILS? There is a box on the right column of my blog for you to sign up with your email address!! Anytime I see a “perfect CCC” I have to test it. Haha! I’ll never stop testing cookie recipes!! What is your opinion on making these with candy? The boys are wanting something like chopped Heath bars and Butterfingers. Absolutely. The amount of chips you remove, replace with chunks of candy. Should be super delicious!! xoxo Miss you, Chrissy! I used to live in Salt Lake City (about 4500 feet above sea level) and made zero adjustments to your recipe other than I only refrigerated for a few hours (other than overnight) and they turned out amazing. I just moved to San Diego (sea level) and they turned out awful 🙁 Any tips for adjusting when at a lower altitude/higher humidity? Here the edges melted and cooked before the middle, they seem strangely puffy and not in a good way, and the flavor seemed off. I’m desperate, I loved this recipe so much! The dough seemed a tiny bit stickier here before refrigerated but not much. Refrigerated it seemed the same as in Utah.